Easy on the battery, but not on the workpiece – Kožul d.o.o. 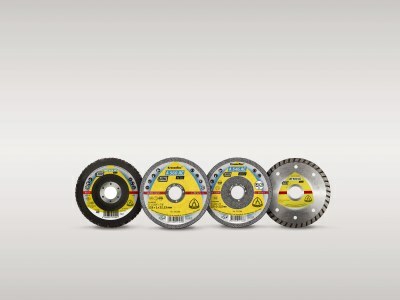 A particular highlight of Klingspor’s new product range is the combined cutting-off wheel and grinding disc A 546 ACCU. It allows for swift cutting and safe grinding without the need for a tool change; a key asset if your work onsite requires a tool that gets the job done – fast and easy. The recipe of Klingspor’s new product range has been perfectly adapted to the performance of battery-powered machines. This optimisation guarantees a particularly high level of aggressiveness without compromising on mobility. The specifically designed bond and abrasive grain guarantee the operator the perfect wear characteristics with consistent removal throughout the entire service life of the tool. Naturally, these latest additions to Klingspor’s new product range also satisfy the strict specifications given in the oSa guidelines, thus keeping the user perfectly safe when used for professional applications. Klingspor’s combined cutting-off wheel and grinding disc A 546 ACCU allows for swift cutting and safe grinding without the need for a tool change: a key asset if your work onsite calls for a tool that gets the job done – fast and easy!